These volumetric Incentive Spirometers help simplify deep breathing therapy, using features that prompt patients to perform and monitor their own postsurgical breathing exercises. An adjustable goal indicator provides a volumetric guideline for adequate lung exercise. Dual-sided calibrations allow clear, legible identification of volumes. The inspiratory indicator encourages patients to maintain an appropriate rate of inspiration. 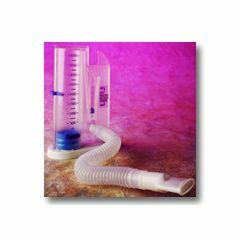 Incentive Spirometers are constructed of sturdy plastic and are compact for convenient use and storage. Units with a one-way valve remind the patient to inhale rather than exhale, helping to reinforce the correct procedure. Durable. Attractive Design. Just like the hospitals. Easy To Use. I have COPD so I keep it by my chair in the livingroom and use it often. Already after the first few uses I could feel that I could take a deeper breath. I do wish that it had some exercises that you could do as I had no instructions with mine. Easy To Use. Durable. Attractive Design. The Airlife was given to my Grandmother to use when in a major Hospital. She bought it home and gave it to me. I've used a Breathing Exerciser to strengthen the muscles in my throught a person uses when swallowing. I was having food and/or liquids come out of my nose when swallowing. I have about illiminated that. This Airlife WILL stegthen the muscles in your throat! Easy To Use. Durable. Simple Interface. light weight. light weight. Easy To Use. Attractive Design. Durable. Easy To Install. Simple Interface.